My niece, age 3, has doll bunk beds that used to be mine. I've been wanting to make her some doll quilts for those bunk beds. I love that she has a toy of mine from my childhood, and I think it doubly cool that I can make quits now for those same beds that I played with. 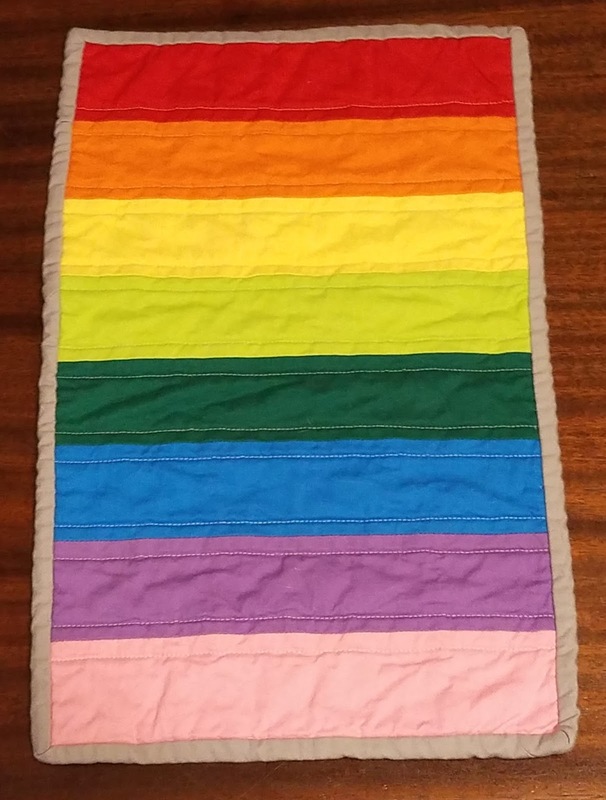 The first quilt I made was a rainbow. I used Kona Cardinal, Orange, Lemon, Sprout, Willow, Malibu, Morning Glory, and Carnation in the rainbow and Medium Gray for the binding. 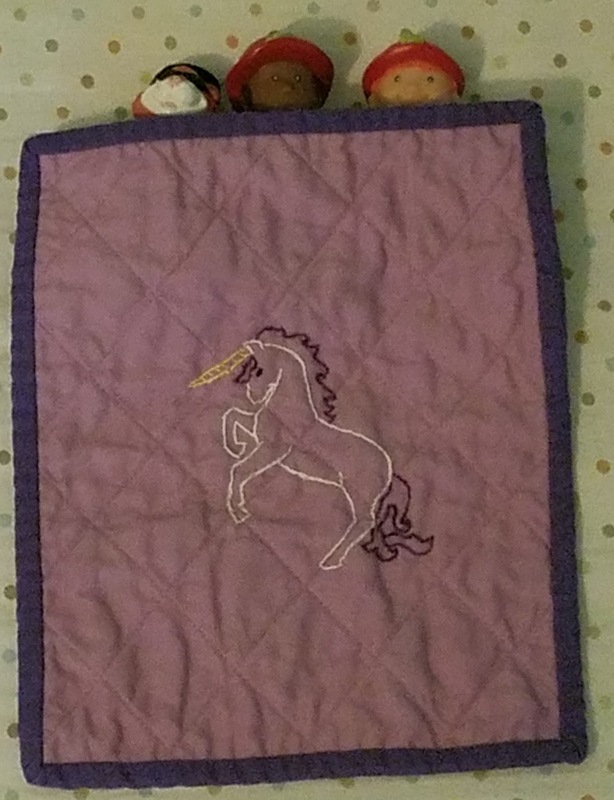 I found a fabulous fabric featuring unicorns with rainbow manes at a LQS recently and knew I had to have some. 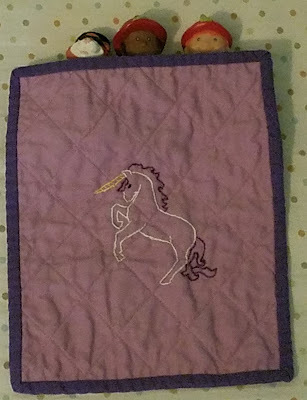 I immediately had my niece in mind for the fabric, since both rainbows and unicorns are on her list of favorite things. 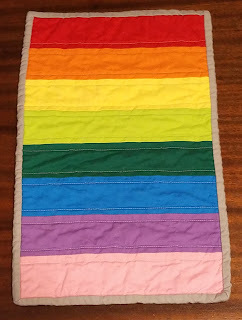 I used it on the back of the rainbow quilt. I don't think this picture does the fabric justice. Since the bunk beds have rails, I made this one to the dimensions of the mattress. I was worried the rails would mean that overhang would be a problem. But it felt too skinny, so I made the next one bigger. I liked the dimensions of that so much better that I decided to make a third, so there would be two the correct size. Keep in mind that the beds themselves are on the other side of the country from me, so I haven't seen how they look on the bed. The second quilt is a simple checkerboard with 2 1/2" I Spy scraps. I used Kona Mulberry leftover from her growth chart as the solid fabric. 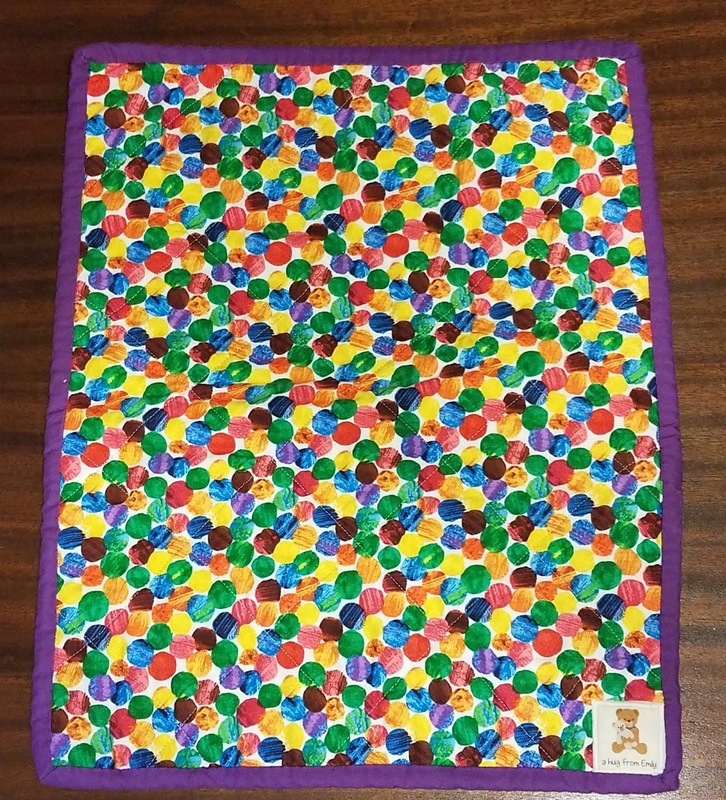 The back is an Eric Carle Very Hungry Caterpillar print that my niece loves--she actually asked her mom to buy some when she saw it at a local children's museum. Turns out Aunt Emily already had some, and I gave most of it to her mom. 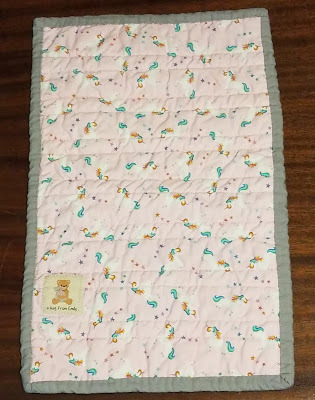 But I kept enough to back a doll quilt since I knew she liked it. 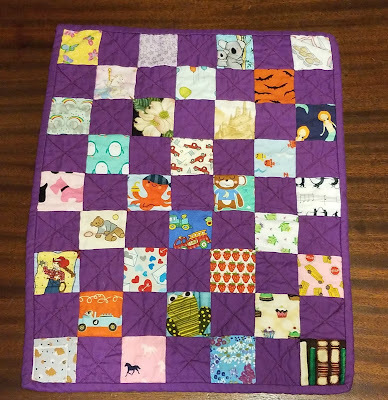 The third quit was on a whim since I was unhappy with the size of the first quilt. 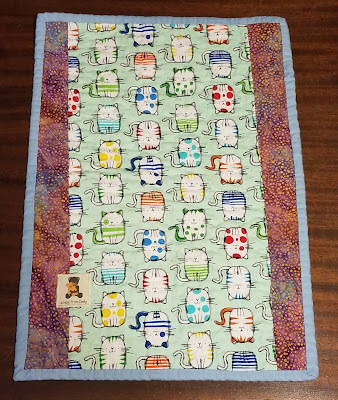 My niece is crazy about cats, so I used the Missouri Star Quilt Company tutorial for their cat block. I made this block as a hive crash for one of my bees last month and it's super easy. I used scraps of a purple batik for the cat and Kona Blueberry leftover from Scrap Dance Tango for the background. For the back, I used the last of the cat print that is on the back of her growth chart. 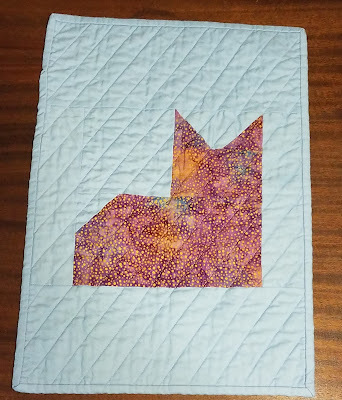 There wasn't quite enough for the entire back, so I pieced in some more of the purple batik used to make the cat for the front. When my niece turned three, my sister-in-law made her this amazing purple doll house that is occupied by a family of small bears. 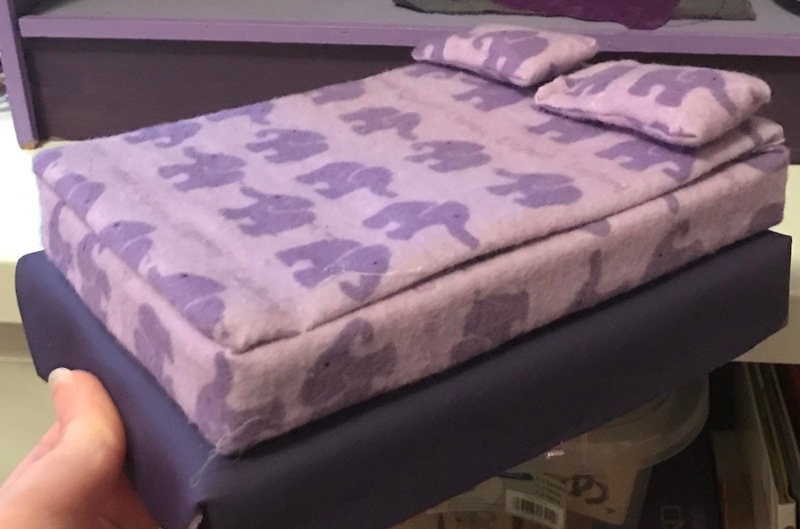 When my SIL sent me the picture of the bunk beds and the dimensions, she also sent me a picture of the bears' bed and said, "And just in case you feel like making a teeny tiny quilt for The Bear House...that measures 5"x7"" Well, how could I not?? 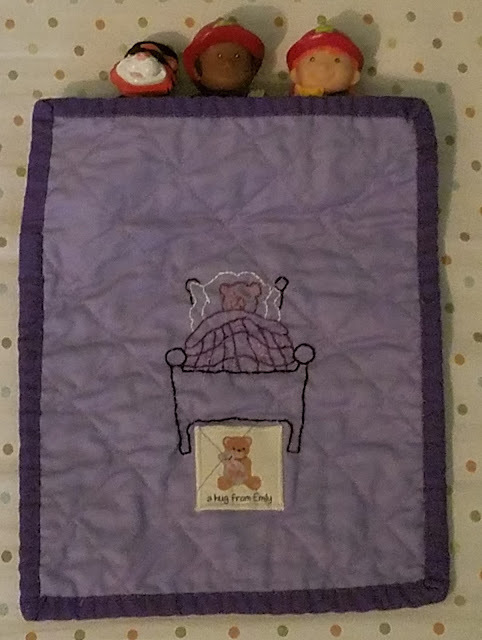 Obviously, a purple Bear House needed a purple quilt. I decided to make it reversible. I couldn't think of a good pieced pattern for something so small, so I went with embroidery. For one side, I chose a unicorn. The fabric is Kona Lupine, with Bright Periwinkle binding. For the other side, I chose a bear in a bed. Yes, it's a bear in a bed, being covered by a quilt, as a design for quilt that will cover a bear in a bed. It's probably the most meta thing I've made. This fabric is Kona Lavender. 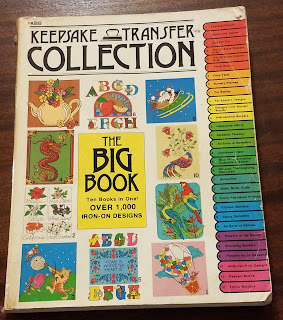 Both embroidery designs are from this book, which we have had in my house *forever! * We traced designs and used them for coloring when I was a kid. 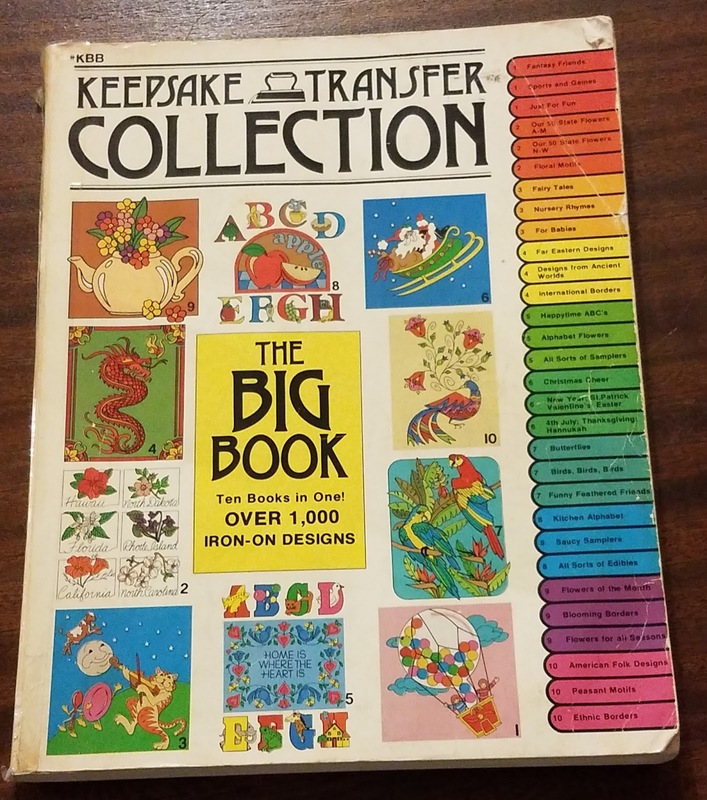 I can't tell you how many school projects that needed to be illustrated I turned in with pictures I traced from this book. And the most surprising thing is, the transfer ink still worked! Now that I know that, I suspect there will be a lot more small embroidery projects in my future! Doll quilts were #2 my list of Q2 goals for the globally hosted finish along. One of my favorite projects is the growth chart I made my son. 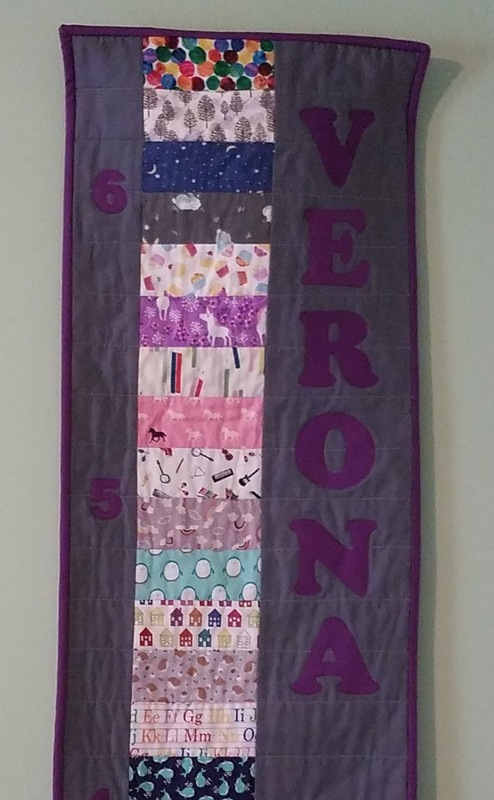 When my brother and his wife and daughter were visiting last December, I asked if they wanted a growth chart for my niece. And I was thrilled that they did! While visiting, my sister-in-law went through my 2 1/2" I Spy strips and picked out the ones she liked and created the order she wanted, and she used my Kona color card to choose Graphite for the background and Mulberry for the name & numbers. 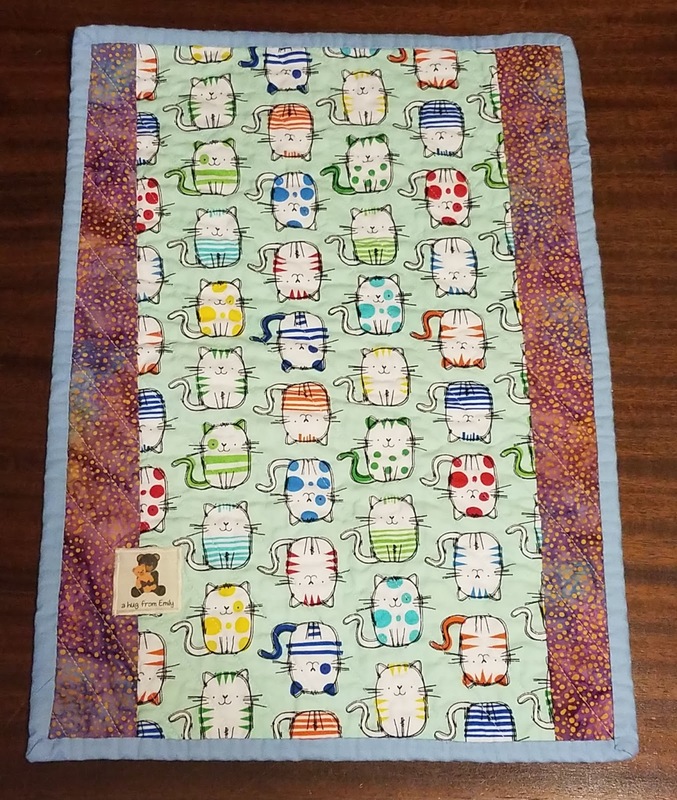 I used a fun cat print for the back because my niece is crazy about cats. Her best friend is her cat, Orco. I used the same method & measurement for this chart that I did when making my son's. I combined this Moda Bake Shop tutorial by Vanessa from the Craft Gemini, with this picture of charts made for twin boys, which were based on this picture into something that works for me. I am really happy with this chart, and the idea in general, and I am now thinking these might make good baby shower gifts when the name is known ahead of time. Sadly, I don't have a picture of this one in use. She should be getting it soon, though, as it is currently on a cross-country trip with my dad, her Grandpa, from North Carolina to Oregon. 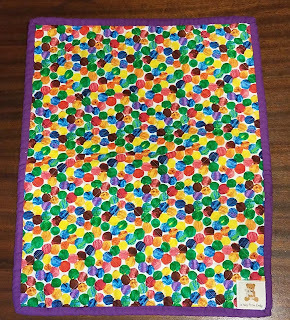 This chart was my June OMG for the monthly motivational link-up hosted by Patty of Elm Street Quilts (I was goal-setter #72) and was #1 on my list of Q2 goals for the globally hosted finish along. I've been gone from Blogland for most of June, but part of that is due to time going in to changes behind the scenes. You may have noticed that The Darling Dogwood has a new look! Every year, my husband asks me what I want for Mother's Day. 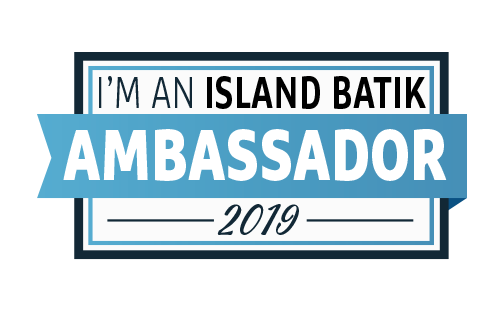 This is the first year I had an answer: a logo! I talked to my friend Paige from Quilted Blooms about her logo and she referred me to Valerie of Inkblot Design Studio. Valerie was awesome to work with and custom designs are remarkably reasonable. I love what she came up with! Once I had a fabulous logo, I decided that the blog itself needed a little bit of polish. I picked out a template from Blogaholic Designs. I communicated with Emily, the designer, and she was amazing. She answered my questions before I even bought anything and gave me support way beyond what I expect for a standard, non-custom, as-is template. If you are looking for a new blog look, check out Emily's templates for quick and affordable options. I did get some projects done in June; there will likely be a flood of posts as I try to get caught up! One of my favorite finishes of 2016 was the growth chart I made for Munchkin. A blast from the past: this was over a year ago! When my brother, my sister-in-law, and my niece were visiting in December, I showed them the chart and asked if they wanted one for my niece, Noodle. (Noodle and Munchkin are only 2 months apart in age.) They said yes. I gave my sister in law all my I Spy strips and had her pick out the ones she wanted. She also picked the colors from my Kona color card. I've got the strips pieced in the order specified by my sister--in-law. 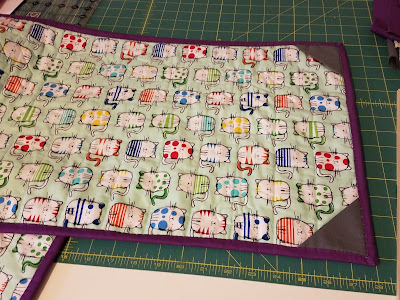 Finishing this chart is my OMG for June as part of the motivational linkup hosted by Patty of Elm Street Quilts.